This year marks the 50th anniversary of the Elroy-Sparta State Trail which is North America’s first Rails to Trails project. This project began a ‘rails to trails’ movement across the state of Wisconsin as well as the United States. Currently Wisconsin has 40 state trails of which 36 are rails to trails which total more than 2,000 miles of trails. Nationwide per the national Rails-to-Trails Conservancy, there are more than 1,900 rails to trails covering more than 22,000 miles. Many organizations throughout Wisconsin are planning events to celebrate the 50th anniversary of the rails to trails project in Wisconsin. The Wisconsin DNR has declared the weekend of June 6th as National Trails Day. On this weekend all fees for trail passes, park and forest admission stickers, fishing licenses and out-of-state ATV passes are waived for the weekend. Many events are currently being planned in towns along the Elroy-Sparta Trail on that day as well. 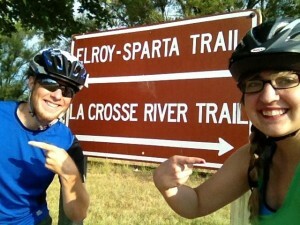 Also a celebration will take place at the Elroy-Sparta State Trail headquarters in Kendall, Wisconsin on June 6th. The climax of the day will begin at 2:00 pm which will include a ribbon cutting and re-dedication of the Elroy-Sparta State Trail, along with keynote speaker former Wisconsin Governor Tommy Thompson who was instrumental in the formation of the Elroy-Sparta State Trail. This would be a great weekend to enjoy the scenic beauty of the Elroy-Sparta State Trail and spend a relaxing weekend at Amil’s Inn which is located in the heart of the Elroy-Sparta State Trail. To keep abreast of the activities being planned for the 50th anniversary celebration in Kendall visit www.elroy-sparta-trail.com and the Wisconsin DNR website and search for ‘trail news”. 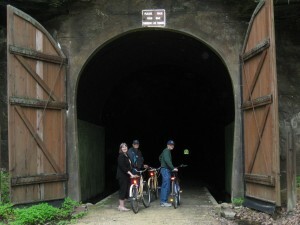 Biking enthusiasts getting ready to enjoy one of the tunnels of the Elroy-Sparta State Trail. The Kickapoo Valley is blessed with many great eating establishments. 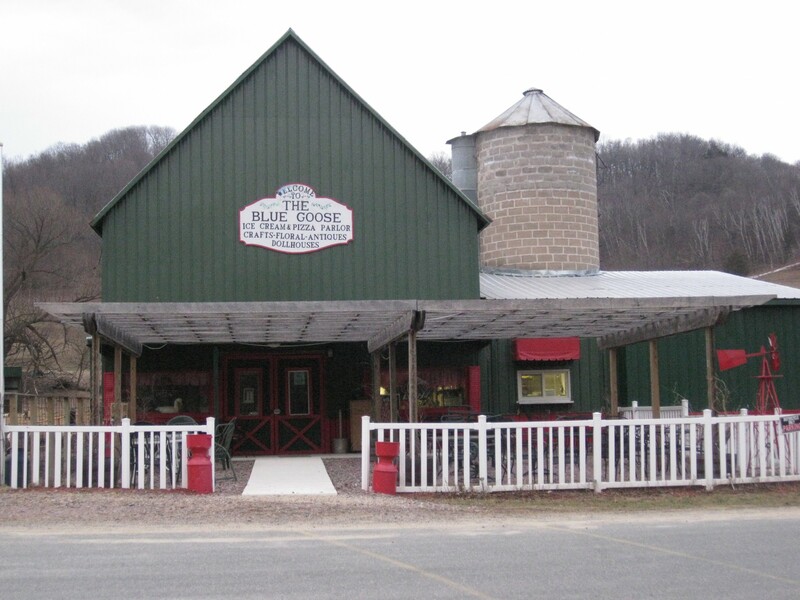 One of our favorite’s for pizza and ice cream is the Blue Goose Ice Cream and Pizza Parlor. Located about 12 miles from Amil’s Inn, it takes approximately 20 minutes driving through some of the most beautiful countryside of the upper Kickapoo Valley and Northern Driftless Wisconsin Area. Once you arrive you will be greeted by Gail and Bill Thomas who remodeled the barn on their property into “The Blue Goose”. You will also be greeted by many farm animals that live on the property as well. You may choose from a variety of pizzas such as Hog Heaven, The Giant German, The Super Blue Goose and a dozen or so more varieties. If you still have room, they serve specialty sundaes, ice cream cones, malts and shakes. They feature Cedar Crest ice cream fresh from the processing plant in Cedarburg, Wisconsin. After dinner you may enjoy Ma’s & Pa’s Toy Shed where a variety of childhood toys live. A vast amount of dolls, trains, dollhouses and trucks are also on display along with Elvis and Santa items. There is a small admission of: Adults–$3.00; Students–$1.50; Children under 6—Free (with a parent). New this year is the Haymow Flea Market located in the old loft of the remodeled barn. Hours of operation are: Thursday- Saturday, 12:00-8:00 P.M.; Sunday, 12:00-6:00 P.M. The Blue Goose is located at S2106 24 Valley Road (North of County Road P), La Farge WI 54639. It is highly recommended to call ahead for a reservation especially if a party of 6 or more (608) 625-4335. For more information visit their website at www.bluegoosepizza.com. As many of you already know, we have been having an ‘old fashion’ winter in Western Wisconsin. There has been an abundance of snow as well as cold. For outdoor activities, the snow and cold makes for great snowmobiling, ice skating, cross country skiing, and snowshoeing. The Elroy-Sparta Bike Trail is open to snowmobilers and is very well groomed. In fact Wisconsin has 110 trails open to snowmobilers with 25,000 miles of well groomed trails. Check out www.travelwisconsin.com or www.wistravel.com for more information. 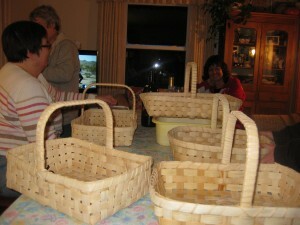 Innkeeper Anita’s high school classmates gather to learn basket weaving. For those who would rather be inside, Amil’s Inn offers a great place for those that do scrapbooking, basket weaving, make a denim blanket, organize recipes or any other project that would need a warm and cozy place. As I look out my window and observe the lawn turning white, I can’t help let my mind wonder back several weeks to the 6th Annual Rails to Trails Marathon. The 6th Annual Rails to Trails Marathon took place on Sunday, November 3, 2013. The day was a beautiful fall day, perfect for the miles that the runners would put on that day. The Rails to Trails Marathon is not only a Boston Qualifier marathon but also a half marathon, 5K and 1 mile fun run. 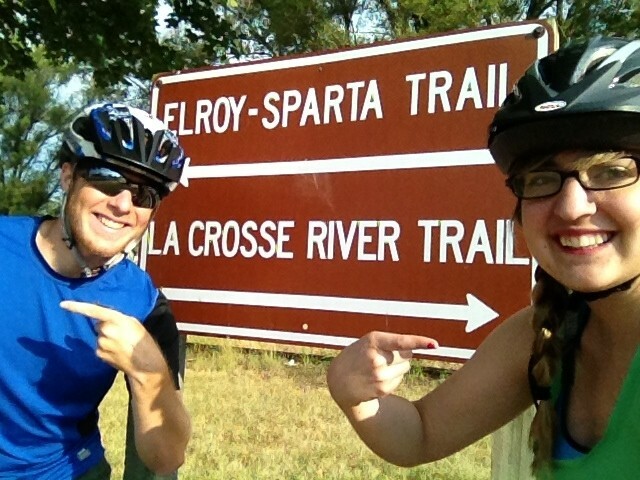 The course takes runners and walkers on tour of the Elroy-Sparta State Bike Trail, a former railroad that’s been converted into a 32 mile recreational trail that winds through the small towns and countryside areas of southwestern Wisconsin between the towns of Elroy and Sparta. The 6th Annual Rails to Trails Marathon had 227 marathon finishers of which 143 were male and 84 were female, 319 half marathon finishers of which 103 were male and 216 were female and 106 5K finishers of which 48 were male and 58 were female. (Results taken from www.itsracetime.com). 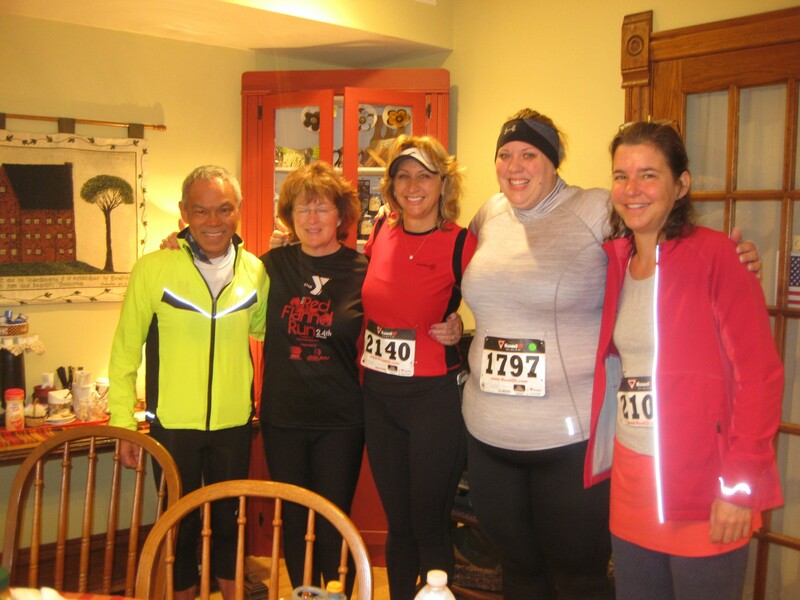 Amil’s Inn Bed and Breakfast was honored to have as guests 2 of the marathon finishers—Roy who qualified for the Boston Marathon and Charlene as well as 3 half marathon finishers—Randi, Chrissy and Rebecca. Also your Outkeeper/Innkeeper Dave and our son Paul completed the half marathon. It was such a joy to have Roy, Charlene, Randi, Chrissy, and Rebecca return to Amil’s Inn after the race to shower and have some ‘serious’ runners talk. To keep abreast of dates and information for the 2014 races, here are the websites to follow: www.railstotrailsraces.com; www.appledumplingdayraces.com; www.elroy-sparta-trail.com or contact us at Amil’s Inn Bed and Breakfast. Icicles on our water fountain. Time to put away for winter. We have been very busy trying to cover up all our beautiful flowers in the cool of the night. This past evening the temperature dropped into the low 20’s. 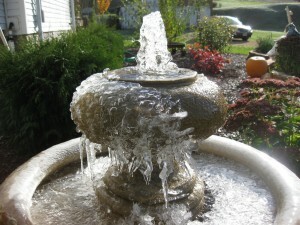 As you can see our water fountain will have to be put away for the winter months. The vegetable gardens have been tilled and the final harvest has been made of most of the garden vegetables. The Lord has been so good to us again this year. We have a trailer full of butternut and spaghetti squash. We share with our guests, neighbors and the elderly that are in need. The only thing that is still left in the garden to feast on before the holidays is carrots and brussels sprouts. Oh…. I still have lemon balm to dry for winter tea. This is a plant that produces so much. It was given to me from an Amish friend (just 3 roots). Ha! Ha! We have to laugh because it is a plant that wants to take over the entire garden. In the spring, we will till circles around it and only allow a 3 foot size area for this plant. Lemon Balm is used not only for teas but also garnishing. Well, I better sign off for now and get a nice simmering slow crock pot ready with chicken and dumplings so we can finish the fall clean up before Jack Frost comes and breaks our water hoses! For those health enthusiasts, come and join us this weekend as the Elroy-Sparta Bike Trail closes the tunnel doors for the winter months after the Rails to Trails Marathon which will takes place Sunday, November 3, 2013. The Rails to Trails Marathon consists of a full, Boston qualifier, marathon, half-marathon, 5K and 1 mile run. Visit www.railstotrailsraces.com for more information. 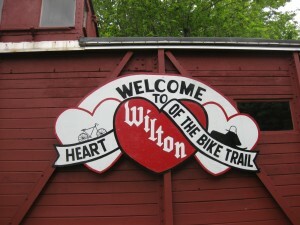 The Wilton information Caboose welcomes you to the Elroy-Sparta Trail. Spring has finally settled in with a few days of 70 degree weather and it’s time to get those bikes ready to experience the more than 50 rails-to-trails throughout the State of Wisconsin. Amil’s Inn Bed and Breakfast is located in the heart of the Elroy-Sparta Bike Trail which was the first rails-to-trails bike trail in the nation which opened to the public in 1967. The Elroy-Sparta Bike Trail is exceptionally beautiful and has three tunnels. Since you will have to walk your bike through the tunnels a flashlight, bike lights and a light rain jacket is recommended. The longest tunnel is approximately ¾ of a mile long located between the towns of Sparta and Norwalk and will more than likely take 15 minutes or longer to walk through. In the middle of the tunnel you will find a small waterfall spring. A Wisconsin State Trail Pass is required for bicyclists age 16 and older. The daily pass fee is $4.00. An annual pass is also available for $20.00 which covers all the rails-to-trails in the State of Wisconsin for the whole summer. Trail passes are available at Amil’s Inn Bed and Breakfast and other businesses in the area. May 1 is the official opening of the Elroy-Sparta Trail for the 2013 biking season. The Sparta Area Chamber of Commerce is hosting a day of celebration on May 1. There will be a community ride from Norwalk to the Sparta Depot. A shuttle will pick up riders at the Sparta Depot (111 Milwaukee Street) at 9:00 AM. At 12:00 noon, a ribbon cutting will be followed by a Department of Tourism speaker, refreshments and biking information from the Wisconsin Bike Federation. So get those bikes dusted off and oiled up and we hope to see you at Amil’s Inn Bed and Breakfast this summer! Safe travels!